"Three Years in Bed and Never a Grumble!" ONCE upon a time there was a village shop. The name over the window was "Ginger and Pickles." It was a little small shop just the right size for Dollsâ€"Lucinda and Jane Doll-cook always bought their groceries at Ginger and Pickles. The counter inside was a convenient height for rabbits. Ginger and Pickles sold red spotty pocket-handkerchiefs at a penny three farthings. They also sold sugar, and snuff and galoshes. In fact, although it was such a small shop it sold nearly everything -except a few things that you want in a hurry like bootlaces-, hair-pins and mutton chops. Ginger and Pickles were the people who kept the shop. 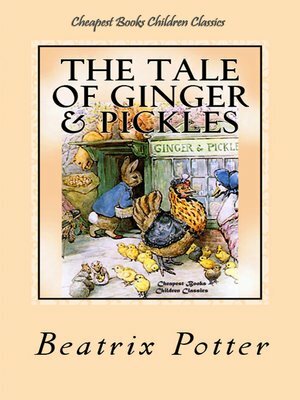 Ginger was a yellow tom-cat, and Pickles was a terrier. The rabbits were always a little bit afraid of Pickles.